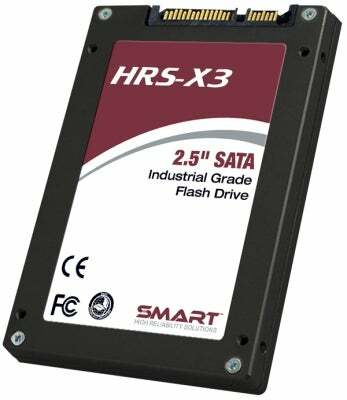 SMART High Reliability Solutions™ HRS-X3 2.5in SATA solid state drives (SSDs) deliver high-performance, high-capacity storage solutions optimised for defence, aerospace and other applications requiring durable, rugged and secure storage. Powered by a flexible, custom flash controller, HRS-X3 SSDs provide sustained read-write performance to meet the needs of high throughput applications such as flight data recorders and sensor data capture. HRS-X3 SSDs are also well suited for high-reliability telemetry, surveillance, and mission-critical applications. HRS-X3 SSDs offer nearly a full terabyte of storage using highly reliable single-level cell (SLC) NAND flash. HRS-X3 SSDs are more reliable, offer superior performance, and require less power and cooling than traditional hard disk drives (HDDs). Conforming to SMART’s ‘true’ industrial grade standards, the HRS-X3 SSDs are superior to typical SSDs and HDDs in terms of ruggedness, vibration and shock resistance, and environmental resilience. The HRS-X3 includes AES-XTS 256-bit encryption, which automatically protects all data written to the drive. It also features Erase command, which initially deletes the encryption key and then erases all the NAND flash. The X3 passes MIL-STD-810G and is powered by a flexible, custom flash controller and is a true industrial grade storage solution for ‘no-compromise’ applications. The X3 also employs advanced flash management for enhanced reliability and durability with Self Monitoring Analysis and Reporting Technology (SMART). The X3 is tested at a 100% eight hour burn-in over at -40°C to 85°C.